Late last week, Preapp Partners released the Early Access version of Showmaker onto Steam. Not a game, but rather a bit of creation software, Showmaker allows you to create a digital concert performance. 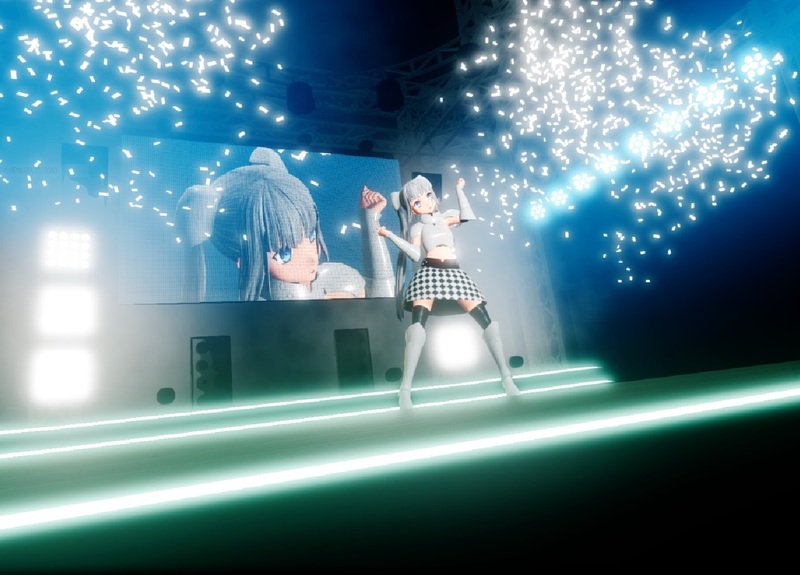 You take a digital idol, put her on a stage and choreograph her dancing and lighting to go with the music. Then you record the performance and stick your creative work on YouTube for all to see. Naturally, as a huge fan of Hatsune Miku (I've been to her live concerts three times, remember), this whole idea really appeals to me. Really, really appeals to me. Showmaker in its current state is a little light on options to enable genuine creativity, but it's off to a brilliant start. But first, the app's current limitations. There's only around five songs, for a start. 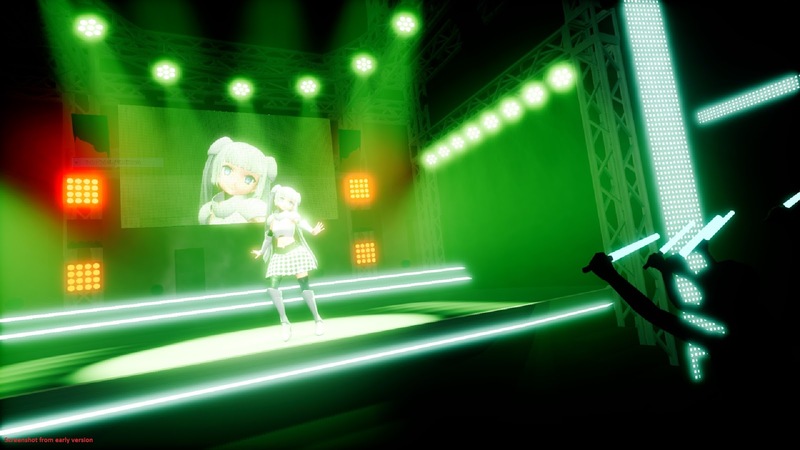 There's another eight or nine "karaoke" tracks, which plays the background music without vocals, but in the context of a concert designer, these feel pointless in the extreme. There are a fair few dance moves in there to give to the character, but they're all variations of her effectively dancing on the spot; at the moment there's no way to have her move from one side of the stage to the other. There are plenty of lighting combinations to choose between, but you can't work with props, change the costuming, and other presentational elements. But the most critical flaw at the moment is the camera changes. It's possible to shift the camera through a performance - left, center and right of stage - but those changes are jarring and ugly on the eye. The ability to put transitions into camera changes - to blur or blend from one camera change to the other - will help make those camera changes become less maddening. This will all change, though. The developer plans on opening the platform right up, allowing other uses to create assets - costumes, dance moves, new characters, the works - using UE4 Mod Editor. Users will be able to sell this stuff through the app, and will go with the developer's own DLC. Yes, I fully expect a Hatsune Miku model to be added at some stage. The one thing that the developer has been vague on so far is the ability to import your own music. I hope so. It would be great to be able to create your own Hatsune Miku music (though the Miku music software) and then choreograph my own video clips for it through this app. That would be really, really great. But for now, it's a very limited app, with no DLC, and not much to do. It is remarkably easy to use though. Pull up the creation software and you'll have a timeline structure that will be immediately familiar to anyone who has ever used music software in the past, and it's a very simple drag-and-drop interface to put lighting, dance moves, and so on into the game. For reference I was able to build the video you see above in around two hours with some trial and error and not once did I need to refer to a tutorial. For creative software, that is ridiculously easy to use. That's easier to use than RPG Marker or Visual Novel Maker. Of course, getting something special out of the software is going to take a lot more time and effort. As with all creative pursuits, you'll find yourself as inhibited by your own creativity and aesthetics as the software itself, and while I like what I did with that video as a first run, there are so many weaknesses with the choreography and aesthetics, and aside from the jarring camera changes, none of that has anything to do with the software itself. And that's what you want from creative software - something that's easy to learn, and then you continue to find more and do more with it as you practice it further. Given it's completely free to use at this stage, and will be monetised through DLC and other features added in later, there's no reason not to give this a go. It runs on limited hardware, it's easy to use, and you get to make virtual concerns for digital characters. Bring on the updates, because this is something I will use an awful lot.